Taliek Brown was a Guard for the UConn Huskies from 2000 – 2004. He was the point guard that lead the 2004 National Collegiate Athletic Association (NCAA) Championship Team. Taliek holds the all-time assist record at UConn with 722, and the record for double figure assist games with 13. I had the pleasure of talking to Taliek in August 2010, as he reflected on his basketball memories and experiences. Taliek learned to play basketball growing up in Queens, New York with the mecca of basketball, Madison Square Garden, a short distance away. “Playing basketball is what all the kids did. 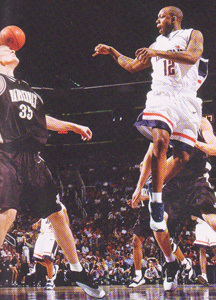 All my friends played basketball so I started playing, got pretty good at it, and just kept improving from there.” Taliek was one of three blue-chip point guards from New York when he came to UConn in 2000. The three blue chip guards continued their rivalry during their college careers all selecting schools in the Big East. 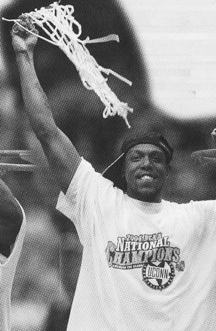 Taliek played for UConn, Andree Barrett played for Seton Hall and Omar Cook played for St. Johns. Taliek had gone to St. John’s Prep School where he averaged 22.5 points per game and 6.6 assists as a senior. He was named to the McDonalds All American Team, was a top 25 national high school recruit, and was most valuable player at the Round Ball Classic All-Star Game with 13 points. During his four years at UConn he had a lot of accomplishments and memories. He was in the starting lineup all four years as a point guard. As the floor general, Taliek led UConn to its second NCAA Championship in 2004, two NCAA Elite Eights, three NCAA Sweet 16’s, and four Big East Championships (two regular and two tournament). He became the assist leader at UConn, and led his team in assists per game in all four years. “As a team my best memory is the NCAA Championship. Individually I’d say the Big East Tournament game when I hit the half court shot.” He was referring to a shot he took that helped UConn beat Pittsburgh in a double overtime victory to win the Big East Championship. Since UConn, Taliek has been enjoying a very successful career in Europe. He has played in Venezuela, Bulgaria, and Macedonia with each team winning their league championship. He has also played for teams in Turkey, Croatia and Poland. Currently he’s playing for Halifax Rainmen in Nova Scotia, Canada.